You are browsing the archive for Spitting Image. If press cartoonists are feeling neglected, press caricaturists are feeling doubly so. The PCO is pursuing an admirable policy of singing the praises of the cartoon to anyone who’ll listen. The highly specialized trade of caricature is even more threatened, however, and I humbly submit that this noble profession should be given equal standing in the campaign. Perhaps it’s the caricaturists’ fault. The standard (and standing) of British caricature has been in steep decline since the press lost interest in it after Spitting Image’s demise, and really good caricature is hard to find these days. Unless we can show the world how potent the art form can be, we will perish, and deservedly so. When faced with something humorous and visceral, people often overlook the care and thought which has gone into a drawing. To a large extent – and I know I’m treading on a few corns here – cartoons are the fast-food of journalism; enjoyed briefly, and then discarded. But good caricatures have a staying power, which is lacking in pocket cartoons. They usually do not have the luxury of a caption to help them along. And the sheer amount of work which goes into them can be out of all proportion to the attention (and fees) they are given. 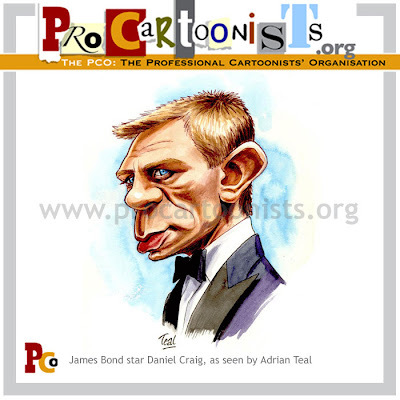 It is this kind of attention to detail, and plain hard slog, which marks the caricaturist out as the sturdy, muscular workhorse of cartooning, and I urge the PCO to help the journalistic world recognize his worth.